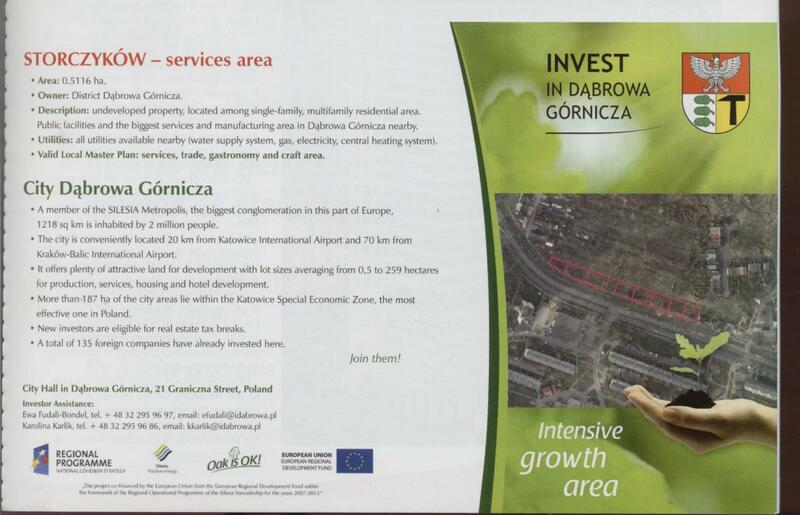 The project is another stage of activities connected with investment promoting of Dąbrowa Górnicza. 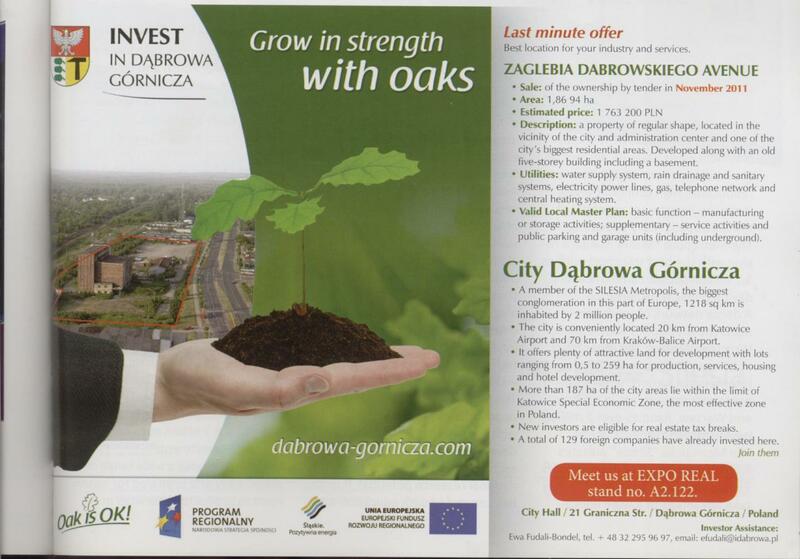 The first campaign under the slogan “Invest in Dąbrowa Górnicza – promotion of the city economic potential”, run between 2009 and 2010, was aimed at promoting 8 investment areas and creating the city brand as a dynamic development centre. That stage included participation of the city in investment real estate fairs and running a promotional campaign, both in Poland and abroad. 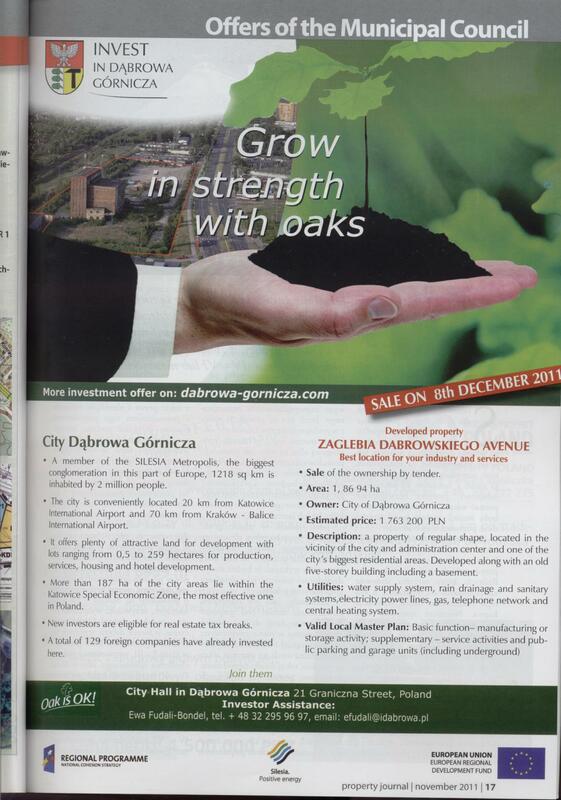 The web page for the investor www.dabrowa-gornicza.com, created in 2009, was one of the most important tools. Thus, the decision was made to update and modernise it. The new campaign, planned for 2011-2013, includes a number of activities directed and promoting the economic potential of the city in order to attract new investors. 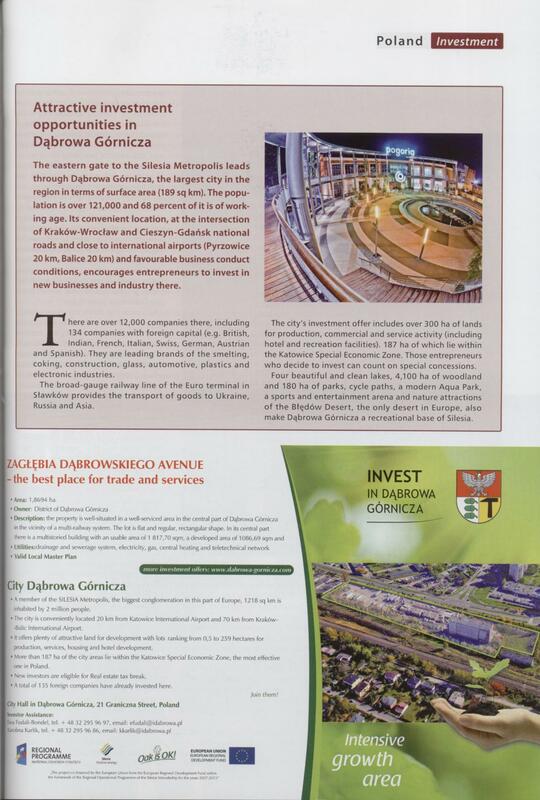 The direct goal of the “Invest in Dąbrowa Górnicza – promotion of the city economic potential – stage 2” project is the increase in recognition of the city investment offer, and, consequently, the increase in volume of direct investments that are to be realised in the future in Dąbrowa Górnicza. 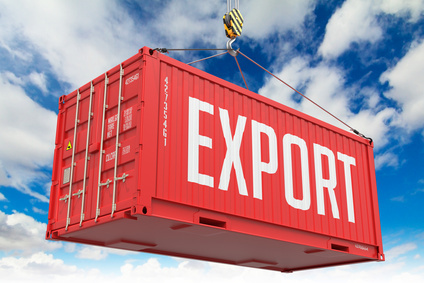 The project is directed at further promotion of the economic potential; however, new forms of promotion will be used and the number of investment areas will be increased – the enterprise is to promote 15 investment areas. Compared to the first stage of the project, the decision was made to intensify the actions concerning investment promotion. The number of potential city partners with whom contact will be established should reach 80 people/companies, 25% of which will be the participants of the investment seminar, 50% – investors at whom the B2B campaign is aimed, and the last 25% will be the investors contacted during the economic missions. The number of promotional material used will also be increased (15 types altogether, including the web page and national and foreign press publications), which will certainly influence the diversity of activities undertaken. West Europe (e.g. Germany, France or Spain). Creating promotional material referring to the creative line of the “Oak is OK” campaign which was created as a part of the first stage of the project, in line with the Project Visual Identification System, including, among others: a multimedia presentation, a movie and an advertisement spot; professional photos of the investment areas (including air photos); CDs/DVDs and USB data storage devices containing a multimedia presentation of the investment offer; promotional brochures containing the presentation of the city economic potential, including, among others, descriptions of the investment areas with maps, descriptions of plots and selected information for the potential investors (A4 size cards in 5 language versions). Additionally, the following will be prepared: a rollup and a promotion wall for exposing during meetings with potential investors, seminars, conferences, etc. ; sets of gifts and promotional materials on four selected investment areas, containing the area name, detailed map and a sample visualisation. positioning the city web page in browsers (www.dabrowa-gornicza.com). 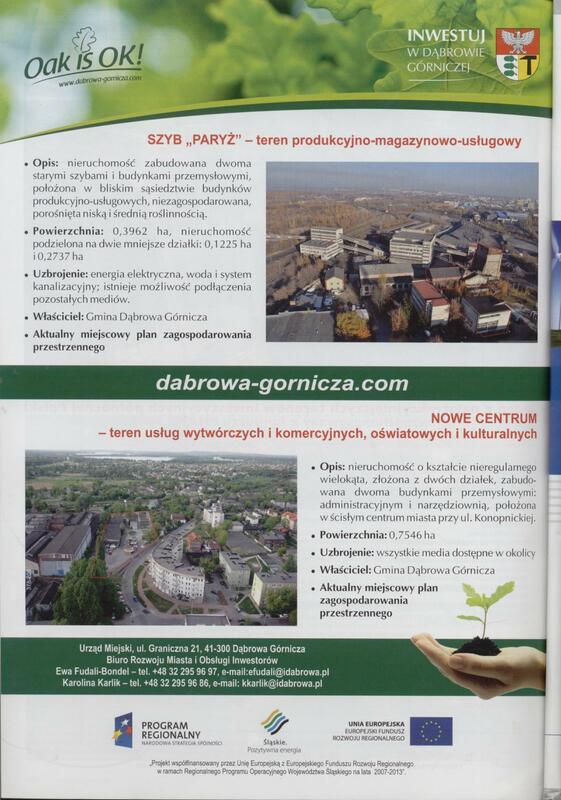 a number of materials in Polish publications promoting Dąbrowa Górnicza as the best place for investment localizing – 6 publications in a magazine, a daily or another publication with economic theme (e.g. 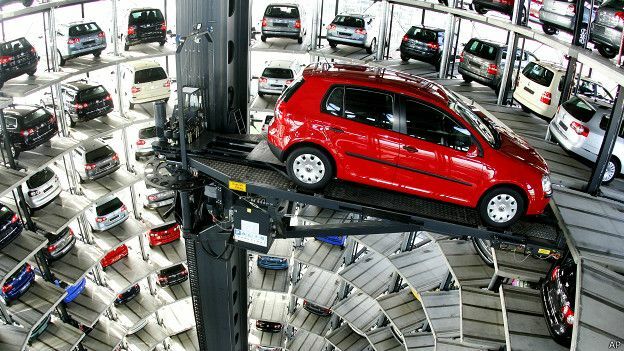 Forber, Nowy Przemysł, Puls Biznesu or Rzeczpospolita – Investment Areas, fair magazines – ABC Targowe). A number of materials in English publications (e.g. 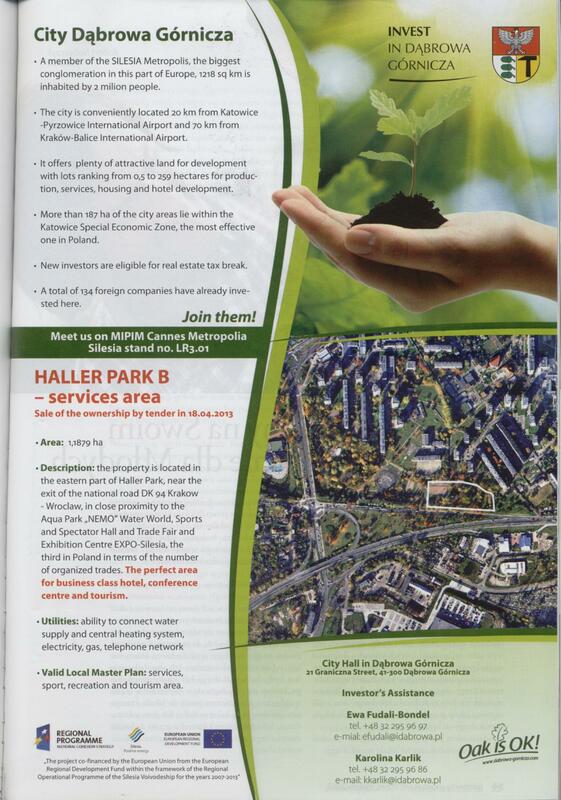 Warsaw Voice, Property Journal, EuropaProperty, CityInwest Poland) – 10 publications in total, including 2 along with distribution of materials in English in monthlies issued during international real estate fairs. 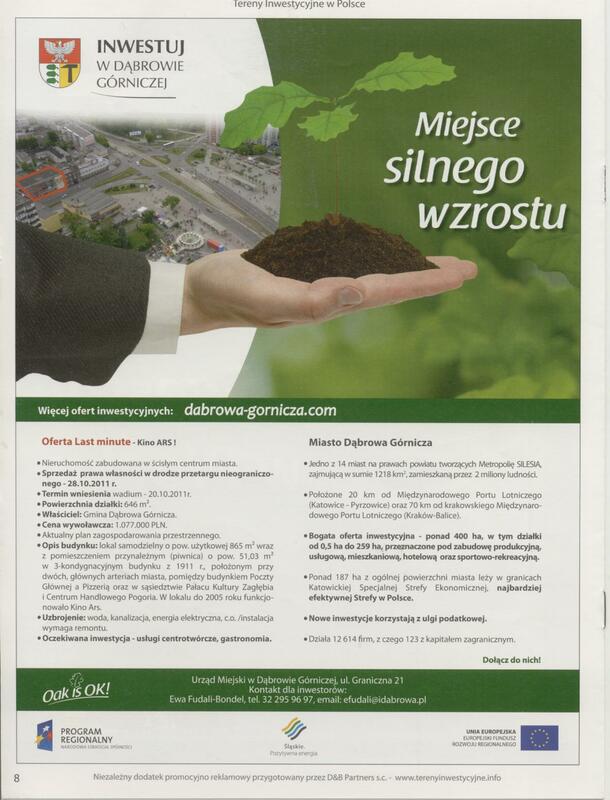 V. Running a direct campaign by means of organising during the first quarter of 2013 an investment seminar presenting the economic potential and investment areas in Dąbrowa Górnicza. During the seminar, to which the potential investors from abroad and journalists will be invited (approximately 60-80 people, including 40 potential investors in total) the visualisation of the investment areas included in the project will be presented – presentation of the spot and promotional movie. VI. Running a B2B promotional campaign by means of running an abroad promotional campaign encompassing direct contact with potential investors, devising a database of 40 potential investors (during 3 years) interested in allocating investments in the Dąbrowa Górnicza city and organising meetings with these investors during large fairs events like EXPO REAL. VII. 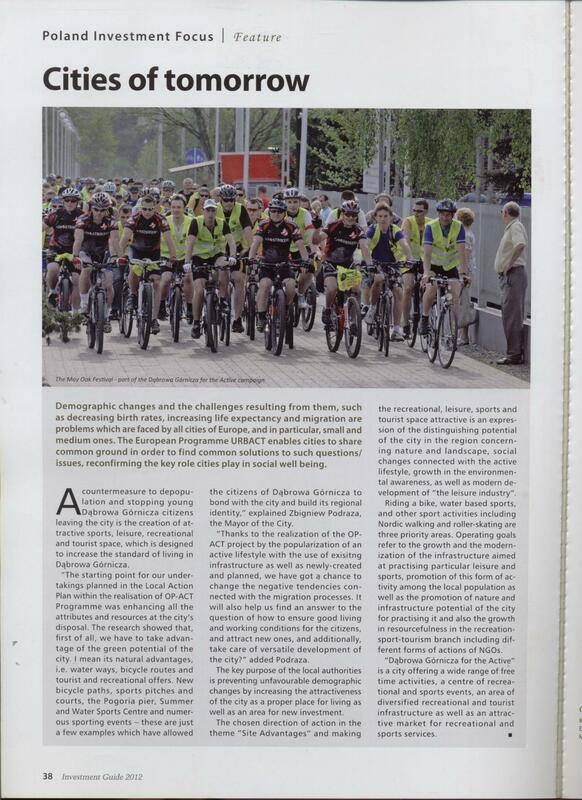 Project promotion means publishing two promotional articles (half a page each) in the local or regional press, as well as in the local publication “Przegląd Dąbrowski”.